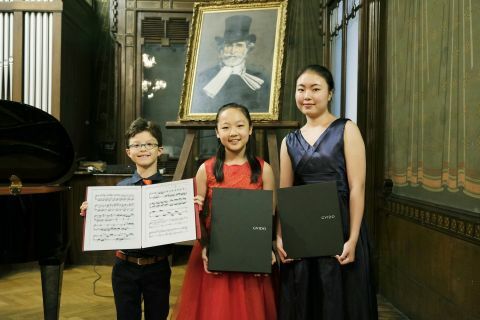 Terrada Music Score Co., Ltd. (Shinagawa-ku, Tokyo; CEO: Fujio Noguchi) provided the GVIDO electronic music score device as a supplementary prize for the Piano Talents Competition 2018, an international competition for young pianists held in Milan, Italy from June 5th (Tue.) to June 10th (Sun. ), 2018. The Piano Talents Competition 2018, which was held this year for the eighth time, is an international piano competition that attracts talented young pianists from around 30 countries worldwide. It was held at the Casa Verdi, a location renowned in the classical music community in Milan. The winners of each of the Kids, Young and Senior divisions were presented with a GVIDO electronic music score device by Terrada Music Score in addition to prizes and scholarships. Terrada Music Score contributes to the support of young pianists that are the future of the music industry, and expects GVIDO to assist in providing a comfortable performing environment to musicians. Please see the following URL for details on the competition. The GVIDO dual-screen e-paper music score device was released in Japan in October 2017, and is available in the North American and European markets. In addition to functions such as easy viewing of music scores and being light in weight, its design has also been well received, and it was awarded the Red Dot Design Award, a globally renowned German design award, in April 2018. See the GVIDO site (https://www.gvido.tokyo/) for details on GVIDO products. The GVIDO store distributing electronic music scores will cooperate with music score publishers to expand the provision of music scores for individual pieces of music. With the addition of AMA Verlag GmbH, Faber Music Ltd., IEU (Edition – Impronta UG) and SCHOTT MUSIC GmbH & Co. KG to the currently available Hal Leonard LLC, the global store will offer pieces published by a total of five companies. Company Name: Terrada Music Score Co., Ltd.